When I saw the CLICK event for this month, I decided I must participate, come what may. I loved the concept and it sure is for a good cause. I had a lot of ideas but nothing was very convincing to me. 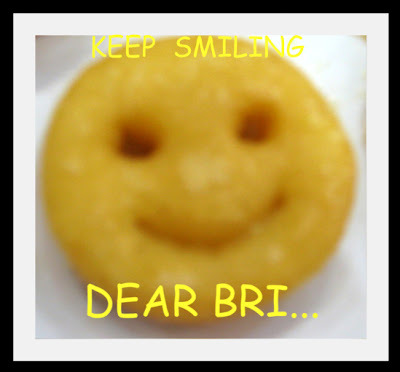 I wanted to CLICK yellow and at the same time convey some message to the world and especially to dear Bri. Don't miss this great opportunity! Participate in this month's CLICK. The details of the event can be found here. Through this CLICK I want to convey the message 'KEEP SMILING ALWAYS'. My best friend used to tell me this during my college days. Smiling Always- Yes, it is the best way to live our life. All of us, in one form or the other, have something bothering us; Something which makes us sad and depressed. Though it is difficult, we sure can over come any worries by smiling. We all know, the one thing which makes every one happy is their Baby smiling. This pure smile makes us forget all the worries and fills our life with joy. Bri, we all know how difficult it is to face something which we are scared of. Hats of to your confidence and strength. Keep smiling always and God is with us! Good Luck! I want exchange link with your blog, my blog is about soup recipe. Please leave me a message if you wanna exchange link with me. Thank you. That is a nice smiley you have :) Good entry! Thats a very cute click..